I’ve had “make homemade Sriracha” on my life list for four years, which is weird because I don’t actually eat very much Sriracha—I put a little in phở or tomato soup now and then, but I’m not the type to slather it over everything (I made that mistake the first time I ever ate it, using it like salsa on top of a bowl of rice and beans and nearly burning my face off). Now I actually wince when I see people squirting more than a dab on top of eggs or into a burrito. 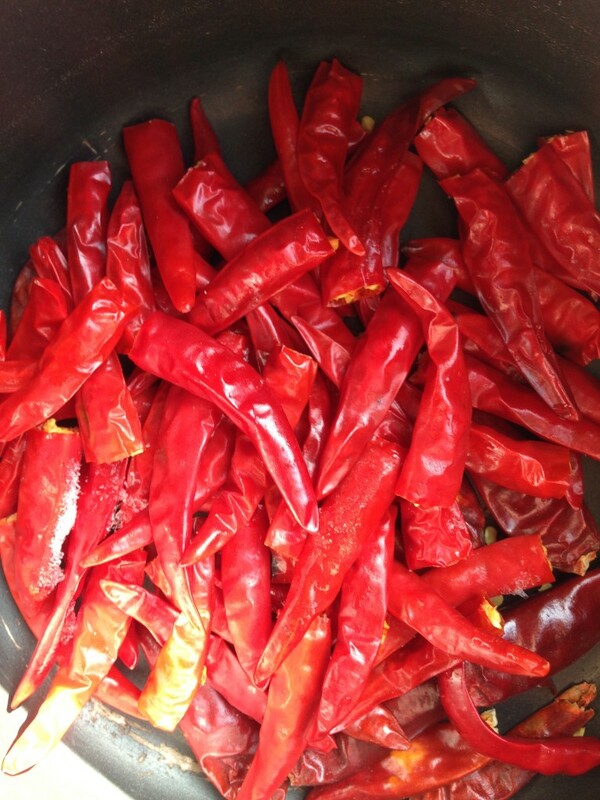 A New York Times article on homemade hot sauces burrowed itself into my thoughts nonetheless, though, which is why I found myself stirring a boiling pot of chilies today while trying not to breathe in too many vinegar fumes. A ton of recipes exist for homemade Sriracha, ranging from a Paleo version with jalapeños and honey to a fermented version using xanthan gum for thickening. Some need a week of fermentation, others a few days in the fridge to let the flavors meld, and others are ready to go as soon as they’re cool. Step one: break or chop off the stem end of the chilies and chop the bell pepper. I ended up with around a cup and a half of loosely packed chilies and around a cup of chopped bell pepper. Add to a saucepan with enough water to cover. Step two: Add a few chopped cloves of garlic, around half a tablespoon each of sugar and smoked salt, and a healthy pour of apple cider vinegar (around a quarter of a cup, maybe?). 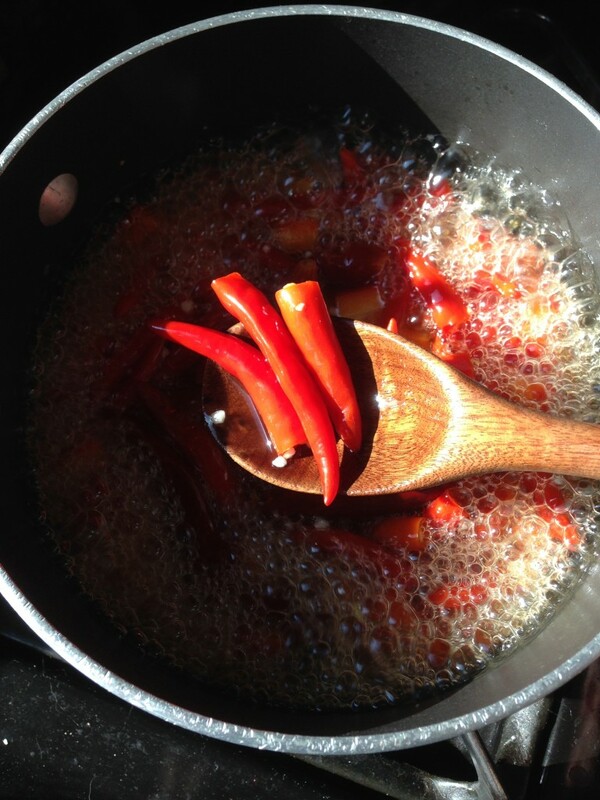 Bring to a boil, and keep there for around 25 minutes, or until all chilies and peppers can be easily mushed (technical term) with the back of a spoon. Step three: attempt to blend with an immersion blender; splash hot chili juice over yourself and your computer. Regroup; scrape everything into a food processor and process until no chunks of pepper remain. 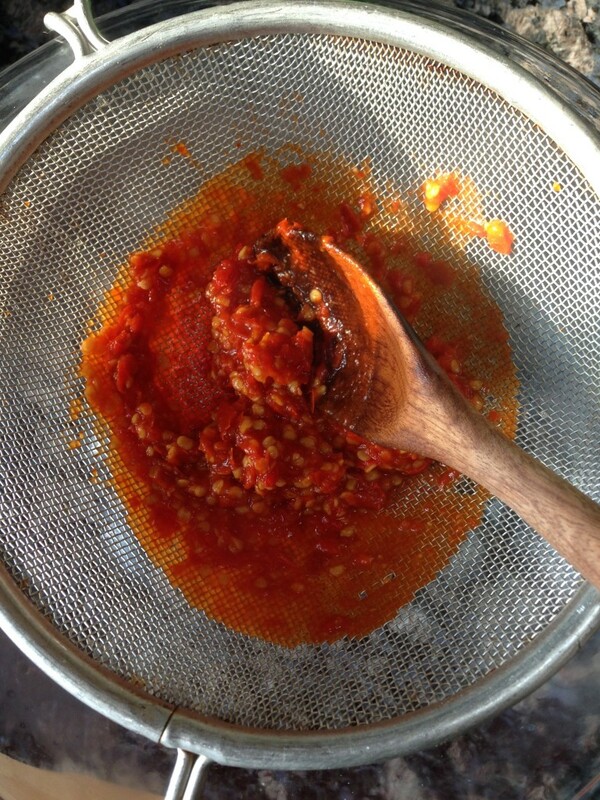 Step four: strain through a fine mesh sieve to remove seeds (not necessary—you could totally leave the seeds in, but I wanted to make sure I could squirt the sauce out of a regular Sriracha bottle without clogging the tip). 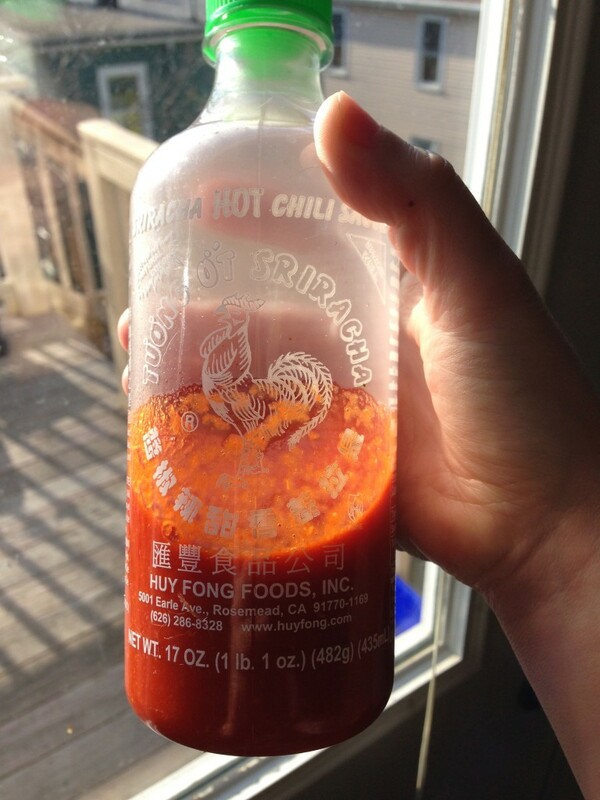 Step five: bottle (in a recycled Sriracha bottle, obviously) and taste. Burn face off, which is how you know it’s good…? I am not at all the right person to evaluate whether this is quality Sriracha or not, or whether there’s any nuance at all to the flavor, as I’m still drinking milk and trying to stop sweating.